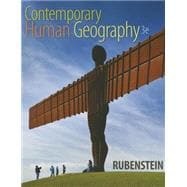 Contemporary Human Geography is a beautifully crafted, modular springboard into essential human and cultural geography concepts, designed for the contemporary geography student. This brief, innovative text explores current human geography in the bold visual style that distinguishes Dorling Kindersley (DK) publications. Topics within each chapter are organized into modular, self-contained, two-page spreads. Together with the graphics, Rubenstein’s efficient writing presents information clearly without sacrificing the high-quality geography content essential to students and instructors. The Third Edition offers an updated cartography program, new pedagogical tools to help guide students, and the latest data and applications. This title is also available with MasteringGeography -- an online homework, tutorial, and assessment program designed to work with Contemporary Human Geography to engage students and improve results. Interactive, self-paced coaching activities provide individualized coaching to keep students on track. With a wide range of visual and media-rich activities available, students can actively learn, understand, and retain even the most difficult concepts. like to purchase both the physical text and MasteringGeography search for ISBN-10: 0321994302/ISBN-13: 9780321994301. That package includes ISBN-10: 0321999010/ISBN-13: 9780321999016 and ISBN-10: 0134007956/ISBN-13: 9780134007953. MasteringGeography should only be purchased when required by an instructor.